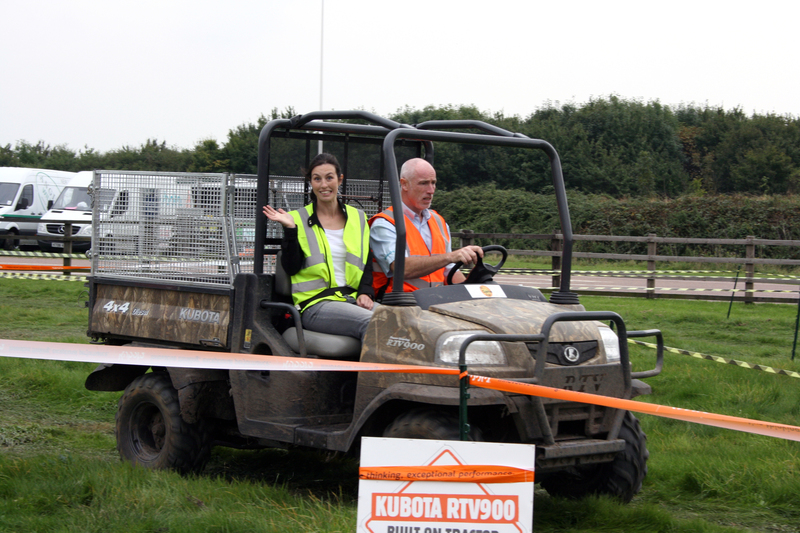 Testing the machinery at Kubota Live! Last week a colleague and I went to one of the roadshows that our client, Kubota (a tractor and groundcare machinery manufacturer) run across the UK, bi-annually. To have unlimited access to all the machinery is fantastic! By driving these machines we got a better understanding of what makes them good and why we’re doing the marketing/ advertising/ promotional stuff for them. Also it was ACE! As long as you have a high vis jacket on, its all go – most of the machines have the keys in the ignitions ready for you to just hop on a try the machine out (with some instruction, of course!) Here I am on an RTV (a utility vehicle) which is brilliant fun, even for a girl like me! Whilst zooming about round the RTV course was great, my personal favourite was the mini diggers, I got carried away digging myself a proper little trench, in true Krypton Factor style fashion.